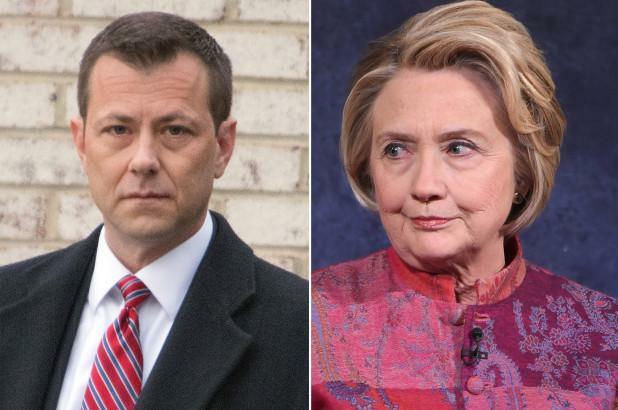 As we sift through the ashes of Thursday's dumpster-fire Congressional hearing with still employed FBI agent Peter Strzok, Luke Rosiak of the Daily Caller plucked out a key exchange between Rep. Louie Gohmert (R-Tx) and Strzok which revealed a yet-unknown bombshell about the Clinton email case. Nearly all of Hillary Clinton's emails on her homebrew server went to a foreign entity that isn't Russia. When this was discovered by the Intelligence Community Inspector General (ICIG), IG Chuck McCullough sent his investigator Frank Ruckner and an attorney to notify Strzok along with three other people about the "anomaly." Four separate attempts were also made to notify DOJ Inspector General Michael Horowitz to brief him on the massive security breach, however Horowitz "never returned the call." Recall that Horowitz concluded last month that despite Strzok's extreme bias towards Hillary Clinton and against Donald Trump - none of it translated to Strzok's work at the FBI. In other words; Strzok, while investigating Clinton's email server, completely ignored the fact that most of Clinton's emails were sent to a foreign entity - while IG Horowitz simply didn't want to know about it. Strzok admitted to meeting with Ruckner but said he couldn't remember the "specific" content of their discussion. Meanwhile, “Mr. Horowitz got a call four times from someone wanting to brief him about this, and he never returned the call,” Gohmert said - and Horowitz wouldn't return the call. In November of 2017, IG McCullough - an Obama appointee - revealed to Fox News that he received pushback when he tried to tell former DNI James Clapper about the foreign entity which had Clinton's emails and other anomalies. Instead of being embraced for trying to expose an illegal act, seven senators including Dianne Feinstein (D-Ca) wrote a letter acusing him of politicizing the issue. Meanwhile, a mostly overlooked facet of the Clinton email investigation was unearthed from the official "FBI Vault" by Twitter researcher Katica (@GOPPollAnalyst) in November and updated on July 10 which somehow never made it into the Inspector General's report on the FBI's handling of the Clinton email investigation. In January, 2016 a former State department official walked into the FBI with what they felt was smoking gun evidence in the Clinton email investigation which was so sensitive he wouldn't talk about it unless it was in a SCIF (Sensitive Compartmented Information Facility). Former DoS guy walks into the FBI & asks if they got his package. Wants to be sure the task force for HRCs case gets the evidence. Says he can't talk about the content but will in a SCIF. 🤔🤨 No idea who he is. Part 6; pgs 11-12. Accompanying the evidence, the whistleblower wrote a letter to former FBI Director James Comey describing Hillary Clinton's mishandling of clearly marked classified material. Comey ignored it - which led the whistleblower to file a complaint that Peter Strzok and FBI agent Jonathan Moffa were CC'd on. Random: This FBI entry has always intrigued me. Former SoS guy just walks into the FBI & asks if they got his package. Wants to be sure the task force for HRCs case gets the evidence. Says he can't talk about the content. 🤔🤨 No idea who he is. "The evidence I am providing, along with what you have already acquired, should lead to convictions for the many people involved." "America needs its Attorney General to show us that no employee of the United States Government is above its system of law and justice." "Since I am avoiding any classified information in this statement, I will not expand on this issue further in this letter. I am prepared to discuss this issue in much greater depth in a properly secured location and with those agents having certain TS/SCI clearances and an FBI letter showing need to know." The whistleblower describes how there's no way Clinton couldn't have known certain emails were marked "classified." "Upon learning of this situation and listening to her saying that the information in these emails were not classified at the time they were written, I make reference to the above paragraph about the daily classified document summarizing issues presented to her on a daily basis." The Whistleblower also goes on to explain that he couldn't find a sensitive communiqué between Clinton and the American Ambassador in Honduras on the internal State Department archive, and suspected that it was due to being sent over her private email server. FBI Vault, Part 23; pages 121-132 - Here are two pages of the letter, but read the whole thing though. So given that we now have at least two major bombshells that the FBI sat on, we revisit the case of CIA whistleblower Dennis Montgomery - who similarly walked into the Washington D.C. FBI field office in 2015 with 47 hard drives and 600 million pages of information he says proves that President Trump and others were victims of mass surveillance, according to NewsMax. Under grants of immunity, which I obtained through Assistant U.S. Attorney Deborah Curtis, Montgomery produced the hard drives and later was interviewed under oath in a secure room at the FBI Field Office in the District of Columbia. There he laid out how persons like then-businessman Donald Trump were illegally spied upon by Clapper, Brennan, and the spy agencies of the Obama administration. Montgomery left the NSA and CIA with 47 hard drives and over 600 million pages of information, much of which is classified, and sought to come forward legally as a whistleblower to appropriate government entities, including congressional intelligence committees, to expose that the spy agencies were engaged for years in systematic illegal surveillance on prominent Americans, including the chief justice of the Supreme Court, other justices, 156 judges, prominent businessmen such as Donald Trump, and even yours truly. Working side by side with Obama's former Director of National Intelligence (DIA), James Clapper, and Obama's former Director of the CIA, John Brennan, Montgomery witnessed “up close and personal” this “Orwellian Big Brother” intrusion on privacy, likely for potential coercion, blackmail or other nefarious purposes. In March of 2017, Montgomery and his attorney Larry Klayman of Freedom Watch traveled to D.C. to meet with House Judiciary Committee Chairman Devin Nunes in the hopes that he would ask Comey about the evidence - only to be "blown off" by the Chairman. It seems like we have some serious issues to revisit as a country.